This new article presents a series of apocryphal marks punched on a flat silver dish produced in Paris in the late nineteenth or early twentieth century. 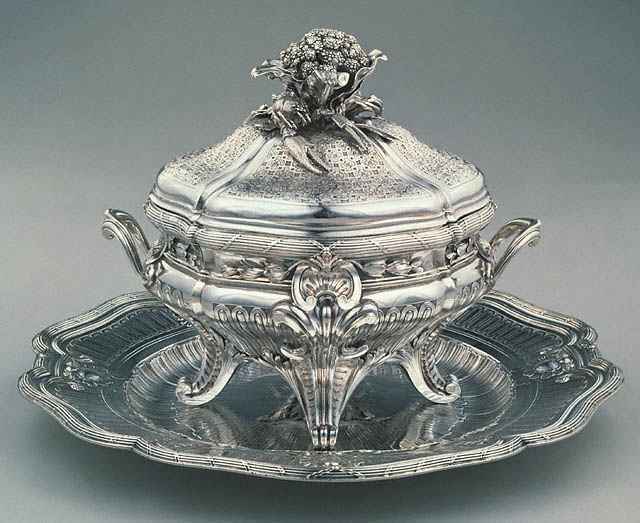 The dish with its lobed edges and double rim contour offers an excellent representation of the taste of the eighteenth century French silver workmanship. Three counterfeited marks are present on the reverse of the dish. - the punch of the famous silversmith Thomas GERMAIN, provider of the King of France and of several other European courts (Master in 1720, died in 1748). They are not authentic ancient marks, and the dish, made according to the eighteenth century French style, is much more recent. I would also note that the manufacturer of this object renounced to tackle the problem of the reproduction of the fourth punch expected to complete the legal series of eighteenth century Paris hallmarks. This mark ("discharge") would be rather difficult to imitate owing to its small size and the variety of details in its design (a "passant horse"). - the false warranty mark (crowned R) shows a summary design and sloppy details at the crown level. 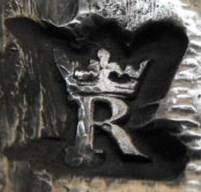 The use of fake hallmarks in silverware was a widespread practice in the 19th century Europe. The phenomenon interested, among other, towns as London, Paris and Hanau (Germany) and found its origin in the need to satisfy the market request of pieces in "old style" bearing, possibly, the marks of prestigious makers. The result is that often such behaviour, possibly not fraudulent at that time, is nowadays seriously deceptive not only for collectors but also for sellers in good faith. In our case the prestigious character of the dish results from the presence of the mark of one of the most famous French silversmiths active during the Ancien Régime (French Royalty), Thomas GERMAIN. 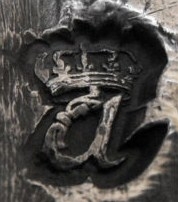 His mark was his initials TG surmounted by the mythological "golden fleece", and a crowned lily (fleur-de-lys). This punch, like the others, is false. GERMAIN Thomas was born August 15, 1673 in Paris. He obtained silversmith mastership in 1720. Appointed royal silversmith to King Louis XV in 1723, he assumed the same duties on behalf of the royal families of Portugal, Brazil, Spain, the Kingdom of Two Sicilies, Denmark and the Sultan MAHMUT. On April 20, 1720, he married Anne Denise GAUCHELET, daughter of a goldsmith merchant. He provided the many golden table services of Louis XV and in 1726 the toilet of Mary LECZINSKA, Queen of France. Thomas GERMAIN died August 14, 1748 in Paris, in the Palais du Louvre, where he had a permanent official housing. His wife Anne died on November 12th, 1758. King Louis XV ordered a requiem mass in honour of his beloved silversmith. Thomas GERMAIN created many models in "rocaille" style largely reproduced after his death by his son, François Thomas GERMAIN, born in 1726. Six months after the death of his father (1748), François Thomas GERMAIN received by the king his silver mastership. Unfortunately, most of the silver and golden artefacts produced by Thomas GERMAIN for Louis XV did not survive and have been destroyed long time ago. This king, still called the "bien-aimé" (well-beloved) by the French, suffered so many financial crisis during his reign that he was forced to melt his own silverware.